Twenty five years ago, when everyone still lived in mud huts and had no running water, a man in America was busy working on one of the most important inventions of the twentieth century. Ok, so the smiley face may not have changed the world, but it is celebrating 25 years of existence today. Professor Scott Fahlman at Carnegie Mellon University in Pittsburgh claims he was the very first person to use the digital smiley. Created using a colon, followed by a hyphen and a closing parenthesis, the smiley is used millions of times a day by people writing emails and chatting in instant message programs. The smiley is especially useful to clarify the meaning of written words; it is able to show intonation in a communication form where misunderstandings can easily occur. To celebrate 25 years of the digital smiley, Fahlman has started an annual student contest for innovation in 'Technology assisted person-to-person communication'. It's called the Smiley Award, and has a cash prize of $500 (£250). 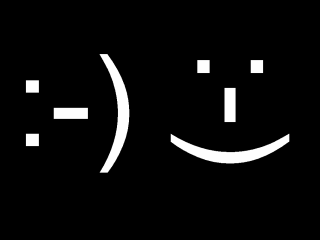 The first smiley was reportedly used on an online message board at 11.44am on 19 September, 1982. "I propose the following character sequence for joke markers: :-)" Fahlman wrote on the board. "Read it sideways," he said. In an interview with the Associated Press, Fahlman said: "I've never seen any hard evidence that the :-) sequence was in use before my original post, and I've never run into anyone who actually claims to have invented it before I did. "But it's always possible that someone else had the same idea - it's a simple and obvious idea, after all."